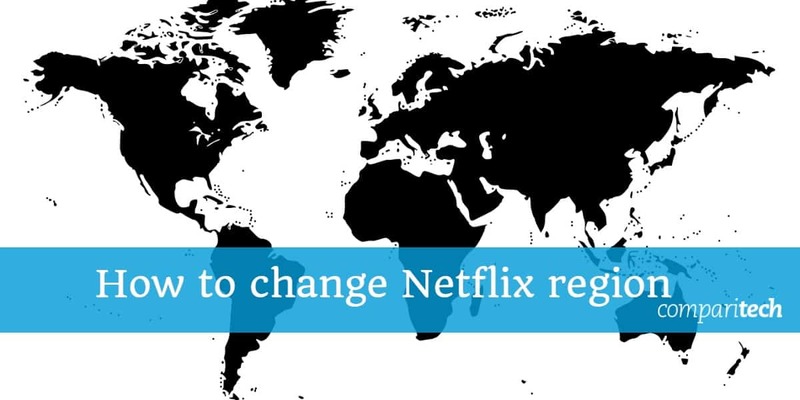 Changing Netflix region or country is easy if you know how. We'll talk you through the process step-by-step so you can unlock access to thousands of additional movies and shows. The only way to change Netflix country catalogs and access TV shows and movies not viewable in your own country, is with a VPN. We'll show you which ones still work and how to use them. If you have a Netflix subscription, you can access content from pretty much wherever you are in the world, except in a handful of countries. However, the catalog of shows and movies you can view will vary depending on the region you’re in. In some countries, the Netflix library is very limited. As such, you may want to trick Netflix into thinking you are in a different region, such as the US, to access a better variety of content. The simplest way to do this is by using a Virtual Private Network (VPN). A VPN tunnels your internet traffic through an intermediary server located in a country of your choice. It can mask your IP address and replace it with one from your chosen country, thus spoofing your location. What’s more, a VPN also encrypts all of your traffic so that no one can monitor your activity, not even your ISP. Once you’re set up with a VPN, getting access to the Netflix library you want is pretty straightforward. How can I change Netflix region or country? Set up a Netflix account if you haven’t already. Download, install, and log into a VPN from our list below. We recommend ExpressVPN. Connect to a server in your selected country. Go to the Netflix website. You should be automatically redirected to the site for the country your selected server is in. Log in if you haven’t already and select your content. ExpressVPN: Most reliable VPN for switching of Netflix countries. Works well with most other streaming services too. Fast speeds, 30 day money-back guarantee. Thankfully, many providers are committed to providing a workaround and maintaining servers that offer reliable access to various Netflix libraries. Even so, not all of these providers offer a comparable service. For streaming, you need to ensure your VPN is fast and reliable. And you also want to know that your chosen provider values security and privacy to the utmost degree. ExpressVPN is an extremely well-reputed provider based in the British Virgin Islands. Its more-than-ample network of over 1,500 servers in 94 countries means you’ll have access to a huge choice of Netflix libraries. Indeed, ExpressVPN reliably unblocks the US, UK, Japan, Canada, and France versions of Netflix, among others. If a chosen server doesn’t work, you can simply contact a live customer support agent to find out which is the optimal server to connect to. Aside from Netflix, ExpressVPN can grant you access to plenty of other geo-restricted content including that from BBC iPlayer, Amazon Prime Video, Hulu, and HBO. All servers are optimized for speed and this, coupled with a reliable service, means you can stream shows and movies seamlessly. As we mentioned, privacy and security are also top concerns to prevent ISPs, government agencies, or hackers snooping on your activity or viewing your personal information. ExpressVPN delivers on this front with 256-bit AES encryption (considered military-grade) and perfect forward secrecy. These features are further supported by a kill switch — which drops the internet connection if the VPN connection lost — and DNS leak protection. ExpressVPN doesn’t monitor user activity and won’t record your IP address. Apps are available Windows, MacOS, iOS, Android, Linux, and certain wifi routers. BEST FOR NETFLIX:ExpressVPN is our top choice. Reliably unblocks Netflix US, UK, AUS, CA, FR, IT, JP, DE and many others from any location. Works with most other streaming services like iPlayer and Amazon Prime with great speeds for buffer-free HD viewing. Try it risk free with the 30 day money back guarantee. Read our full review of ExpressVPN. NordVPN offers up a huge network of servers, comprising more than 3,300 in over 60 countries. It is known for its ability to unblock Netflix, including the US, Canada, Netherlands, France, Spain, UK, Australia, Brazil, Italy, India, and Germany catalogs. It can also access lots of other popular streaming sites such as Amazon Prime Video, Hulu, HBO, and BBC iPlayer. Plus its fast speeds make it even more ideal for enjoying your favorite shows and movies. Some of NordVPN’s servers are even optimized specifically for video streaming. And if you have any issues, you can just ping customer support. NordVPN is another strong player from a privacy and security standpoint. It keeps no logs whatsoever, not even bandwidth data. Security is in the form of 256-bit encryption with perfect forward secrecy. DNS leak protection and a customizable kill switch help ensure your data never leaves the encrypted tunnel. One more unique security feature is that certain servers are optimized to protect against Distributed Denial of Service (DDoS) attacks. You can install NordVPN on up to six devices simultaneously. It has desktop clients for Windows and MacOS, as well as apps for iOS and Android. BEST BUDGET OPTION:NordVPN is a great value option which unblocks most Netflix regions. Strong privacy and security credentials. 30 day money back guarantee. Read our full review of NordVPN. CyberGhost is operated from Romania and offers a growing network of servers with more than 1,200 in 57 countries. While it doesn’t unblock Netflix in many of the regions we’ve tested, it is committed to providing access to US Netflix, which is the version with the largest library. It can also unblock other popular sites like BBC iPlayer, Hulu, and Amazon Prime Video. Many of these are easily accessible through a dedicated tab within the CyberGhost client. Simply click the site you want to access and you’ll be connected to the appropriate server. Speeds are high enough for streaming in HD or even UHD. This provider is another top-performer for privacy and security. It doesn’t monitor any user activity and never records any information that can be tied to a particular user. 256-bit encryption is used with perfect forward secrecy, backed by a kill switch and DNS leak protection. This provider allows up to five simultaneous connections with a basic plan. Apps are available for Windows, MacOS, Android, and iOS. GOOD VALUE:CyberGhost is another good budget choice that works well with Netflix but not all other streaming sites. Stores no logs and streams HD video reliably. 45 day money back guarantee. Read our full review of CyberGhost. PrivateVPN runs a small network of servers, but it does cover 56 countries, meaning potential access to a wide range of Netflix libraries. It can reliably access US, UK, Japan, Spain, Brazil, France, and Italy catalogs, among others. In addition, you’ll be able to unblock BBC iPlayer, Hulu, Amazon Prime Video, and other popular streaming sites. PrivateVPN doesn’t disappoint on speed and its reliable service will enable you to watch shows and videos without buffering. As for security, depending on the protocol you choose, you’ll get 128-bit or 256-bit encryption. The former is still considered extremely secure. You also have DNS leak protection and a kill switch as backup. A no-logs policy means you don’t have to worry about your data falling into the wrong hands. PrivateVPN plans allow for up to five devices to be connected simultaneously. Desktop clients can be installed on Windows and MacOS, and mobile apps are available for both Android and iOS. FAST SPEEDS:PrivateVPN unblocks US Netflix and many other country versions. Allows up to 6 devices on the same account. Small network of servers but fast connections. 30 day money back guarantee. Read our full review of PrivateVPN. Ivacy is a smaller and younger provider than most others on this list, but it’s ability to unblock Netflix is undeniable. Though it only has about 500 servers, it can unblock the US, UK, and Australian versions of Netflix, not to mention Hulu and Amazon Prime Video. Live customer support available on the website can point you to the exact servers you’ll need to use. Ivacy clocked great results in our speed tests, so streamers should be able to watch high quality video without buffering. Security meets all of our standards, as does Ivacy’s no-logs policy. China users will be happy to know it can bypass the Great Firewall and get you into Netflix. Subscriptions are inexpensive and the apps are easy to use. You may connect up to five devices at a time on any plan. Apps are available for Windows, MacOS, iOS, Android, and Amazon Fire TV. BUDGET VPN:Ivacy is a low cost VPN that worked well with US Netflix during our testing. SaferVPN is a US-based provider with more than 700 high-speed servers in over 30 countries. It reliably unblocks Netflix libraries including the US and UK catalogs. Specific servers are labeled for streaming, so you know which ones to choose without contacting support. You can also use SaferVPN to watch content for BBC iPlayer, Amazon Prime Video, and more. It being in the US might be a concern from a privacy standpoint, but SaferVPN keeps no logs of user activity and never records IP addresses. Therefore, there’s no information that could be tied to an individual. Aside from privacy, you can also enjoy premium security with 256-bit AES encryption, DNS leak protection, and a kill switch. A basic plan allows for up to five simultaneous connections with apps available for Windows, MacOS, Android, and iOS. WORKS IN CHINA:SaferVPN is a great choice for users in China as it avoids the Great Firewall. Reliably unblocks Netflix and has great privacy credentials. Read our full review of SaferVPN. Can I use a free VPN to change region on Netflix? Free VPNs are definitely easy to find and indeed can be very tempting. But we’d have to advise you steer clear for several reasons. Providing access to Netflix requires a lot of effort on the part of a provider and free services simply aren’t profitable enough to justify these resources on an ongoing basis. A free VPN might let you explore another country’s Netflix catalog, but when it comes time to watch you’ll almost certainly encounter the proxy error. What’s more, these services typically provide users with a limited selection of servers, which means you’re less likely to be able to access the Netflix library you’re looking for. Even if you do get access, chances are you’ll be frustrated with slow speeds and even having to wait in a queue for some servers. Practicality isn’t the only issue with free services. We’ve put a heavy emphasis on privacy and security above because it’s important for users to know what’s happening with their data. The providers of free VPN services need to make money somehow and often do so through questionable methods. Some interrupt your experience with annoying ads, log your activity and sell data to third parties, or even carry malware. Which country versions of Netflix are available? Netflix started out slowly and solely operated in the US for its first decade or so. It finally expanded internationally to Canada in 2010, and then there was no stopping. 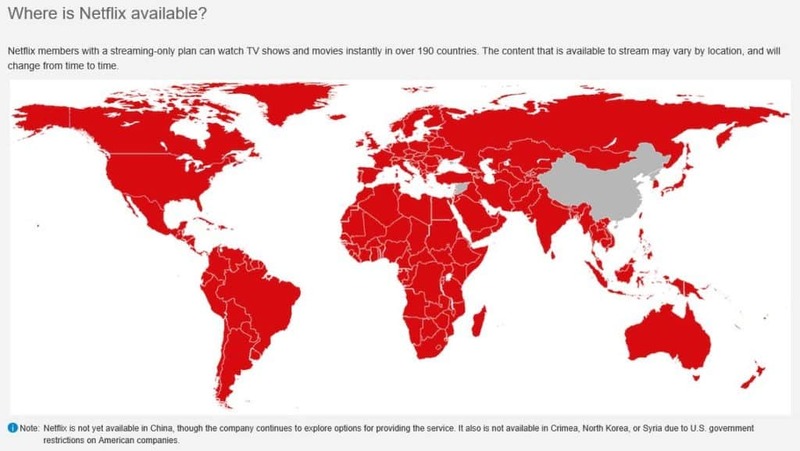 After a massive 2016 expansion, Netflix is now available in the vast majority of countries, the exceptions being China, Crimea, Syria, and North Korea. When it comes to China, not wanting to miss out on this massive market, Netflix has made a push for licensing deals in lieu of having an actual presence in the country. Although Netflix is available in most countries, the catalog of shows and movies varies greatly depending on your region. Aside from having different titles available, some regions have a very small selection. This is due to the different licensing agreements in each region. Here are the top twelve Netflix libraries in terms of the number of shows and movies available (source: Finder). The largest selection of TV shows can be found in the US catalog which, according to Finder, has more than 1,300 shows and over 4,000 movies. This is in contrast to somewhere like Croatia which has just over 200 shows and fewer than 600 movies. Related: Best VPNs for accessing Netflix US, Netflix UK, Netflix Japan, Netflix Spain, Netflix Brazil, Netflix France, Netflix Italy. Does Netflix allow VPNs to access content? As mentioned earlier, Netflix has cracked down on allowing subscribers to watch content through a VPN. If an IP address is known to come from a VPN server, traffic from that IP address will be blocked and you’ll see a proxy error. This means that with some VPN providers, you’ll be locked out even if you connect through a server in the country you’re in, simply for the fact you’re using a VPN. This practice seems illogical from a business perspective as it doesn’t really do Netflix any favors and is frustrating to viewers. However, it is understandable when you consider the content licensing restrictions that Netflix has to abide by. These restrictions mean that the company isn’t allowed to show its entire library in every location. Without these constraints, Netflix could feasibly be the same anywhere. Can I use a DNS proxy to change region on Netflix? Many providers of DNS proxy services will advertise the ability to unblock Netflix and other streaming sites. Indeed, as long as the IP address they provide isn’t blocked by Netflix, then you’ll be able to gain access and enjoy streaming shows and movies. However, the major problem is that it’s very easy for Netflix to block DNS proxies, so they end up being very unreliable. They also tend to have fewer countries available, so you have less chance of finding the library you want. One proxy that doesn’t suffer from these issues is ExpressVPN’s MediaStreamer DNS service, which is included in every subscription. It’s used by default when you connect to the VPN but can also be configured separately. More importantly for some, a DNS proxy does not encrypt your traffic, so your activity is open to your ISP and anyone else who might be snooping. Plus these services are often free, and in the same vein as a free VPN service, they may be collecting and selling your information, injecting annoying ads, or using other shady or invasive practices. Using one of the VPNs on our list above should provide you access to a range of Netflix libraries. However, there could still be one or more hurdles to overcome. We’ve got a checklist for you to run through to make sure you get to watch your shows. Check with the VPN provider’s customer support team to see which server to use. They get these requests all the time and you should be able to receive a prompt response. This is your best bet if your provider offers live chat. If not, the next couple of options might be worth trying first. Disconnect and reconnect to the same server. You’ll sometimes end up with a different IP address that may not be blacklisted. Try connecting to a different server in the same region. Again, this will give you a different IP address that might not be blocked. Log out of any accounts that cache your IP address, such as any Google account. Go into your device or browser settings and disable any location services. Try clearing your cache, cookies, and temporary files. If you’re using Windows 10, you can try disabling IPv6 in your wifi properties and flushing your DNS cache using the command prompt ipconfig /flushdns. If you’re using a wifi network and have access to the router, you can rename the network to opt out of Google’s geolocation services. Append “_nomap” (without quotation marks) to the end of the network name and reconnect your device to the network. 1 How can I change Netflix region or country? 15 Can I use a free VPN to change region on Netflix? 16 Which country versions of Netflix are available? 17 Does Netflix allow VPNs to access content? 18 Can I use a DNS proxy to change region on Netflix? 9 Can I use a free VPN to change region on Netflix? 10 Which country versions of Netflix are available? 11 Does Netflix allow VPNs to access content? 12 Can I use a DNS proxy to change region on Netflix?